Fall. Apples. Honey. Cider. Mead. I like dry red wine. I have to be in the mood for sweet and bubbly. Yet…there is something about a good mead that I am always in the mood for. The sweetness isn’t light or crisp…it’s warm and hearty like a cider with the punch of a glass of merlot. My grandma called me and told me the branches on her apple trees were dragging the ground with the weight of their fruit. So…the boys and I went apple picking at Grandma’s house. Another item checked off our fall bucket list. 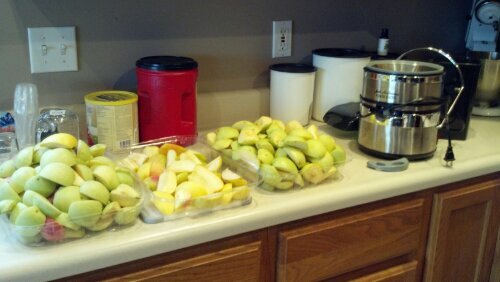 Grandma had already made 18 quarts of applesauce that she is distributing to the grand kids, so we decided to make mead. *Note: These are the ingredients and amounts we used. You can adjust the recipe to your taste, use different fruit, skip the brown sugar and adjust the amounts. Technically, when made with fruit, the drink is called a cyser. You can make it with just honey and it will turn out just fine. Sanitize everything each time you are going to use it. Instructions will be on your sanitizing solution. 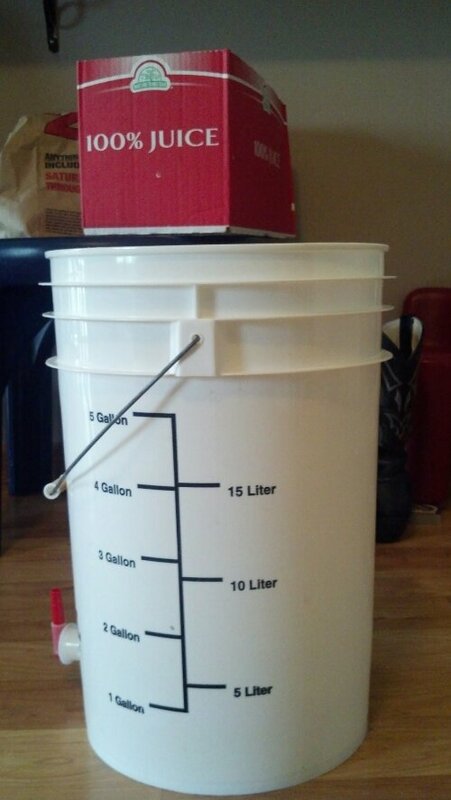 Pour apple juice in a 5 gallon bucket. If you juiced fresh apples there will be a thick foam on top that you will need to skim off. I am going to use it in cookies or some sort of baked good. Add ingredients in this order, stirring after each addition: brown sugar, honey, water and yeast. Stir well, put the lid on the bucket and the airlock on the lid and place bucket in a spot where it won’t get messed with. This is the first step in making mead. Right now, our mead is fermenting in the bucket and the water in the airlock is bubbling away. 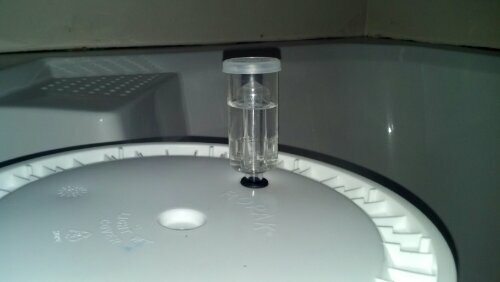 You will know when your mead is ready to go to the next step when the water in the airlock stops bubbling. When that happens, wait three more weeks before transferring to the glass jug. This is where the siphon comes into play. Siphon all the liquid, leaving the sediment behind. It should settle to the bottom of the bucket. Place the bung on the bottle and test every couple of weeks until it reaches the abv you are shooting for. Your yeast packet will have a tolerance listed…we use that as a guide but not a hard and fast rule. When the abv is where you want it you will need to wait a minimum of 6-8 months before bottling. This is to make sure that the mead has degassed which means that there is no more CO2 in the mead. This is important so that you don’t have glass bottles exploding all over the place. Once it tastes good to you, it’s ready to be bottled and stored in a cool dark place. While the mead is now drinkable and probably tastes pretty good, resist the urge to drink all of it right away. Remember, the longer it sits, the better it tastes. This entry was posted in 13 Skills. Bookmark the permalink. You make it sound so easy to do. I wonder what Cherry Mead would be like? It took me a long time to fully understand all the steps. I bet cherry mead would be excellent! Although…I would buy the juice. If it took an afternoon and 3.5 5 gallon buckets to juice enough apples to make 3 gallons, imagine how long and how many cherries it would take to get enough juice!